Did you know that more than half – 53% – of homeowners believe that right now is a good time to kick-start the home remodeling process? And they’re right. 2015 has been slated as the year in which the home renovation and design industry will make a full comeback. After years of struggling alongside the collapsed housing market, it seems that things are finally on the up and up. 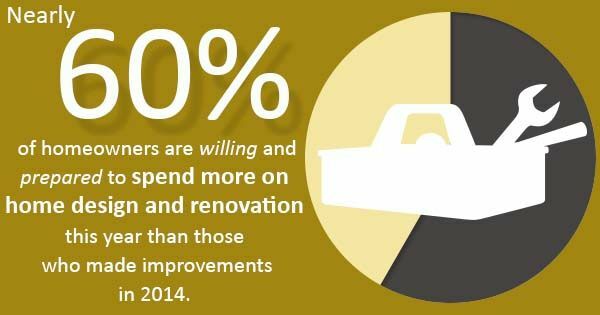 This is highlighted by the fact that nearly 60% of homeowners are willing and prepared to spend more on home design and renovation this year than those who made improvements in 2014. The home remodeling industry has always fared better than the housing market; however, that gap continues to widen as more homeowners are deciding to improve rather than move. Before diving headfirst into your next home renovation and design project, it’s important to do a little research and find information on remodeling a home. The more information you have, the better and smoother the entire process will go. While it may sound self-explanatory it’s important to first consider why you’d like to start a home renovation and design project. Are you making improvements in order to sell your home? Or, do you simply want to spruce things up a bit? This will help you determine the aesthetics of the process. If you plan on selling your home, you may want to keep the design fairly simple or neutral in order to appeal to a wide range of tastes. In addition, it’s important to create a budget for your project. How much can you realistically and comfortably afford to spend on this project? Will you be paying with cash, or taking out a loan or a line of equity? It’s also important to consider unforeseen expenses that may occur during the process. Consult with your contractor in order to estimate a figure that works for you.